EASY SET UP AND INSTALLATION- The decorative curtain rod is packaged already set up- just choose a length and install the mounts! This set also comes with all needed mounting hardware including screws, anchors, and mounting brackets for an easy installation. ADJUSTABLE LENGTH-The extendable curtain rod can be a perfect fit for any medium to large size window in any room in your home. The decorative rod can easily adjust to the size of your window by pulling out or pushing in. 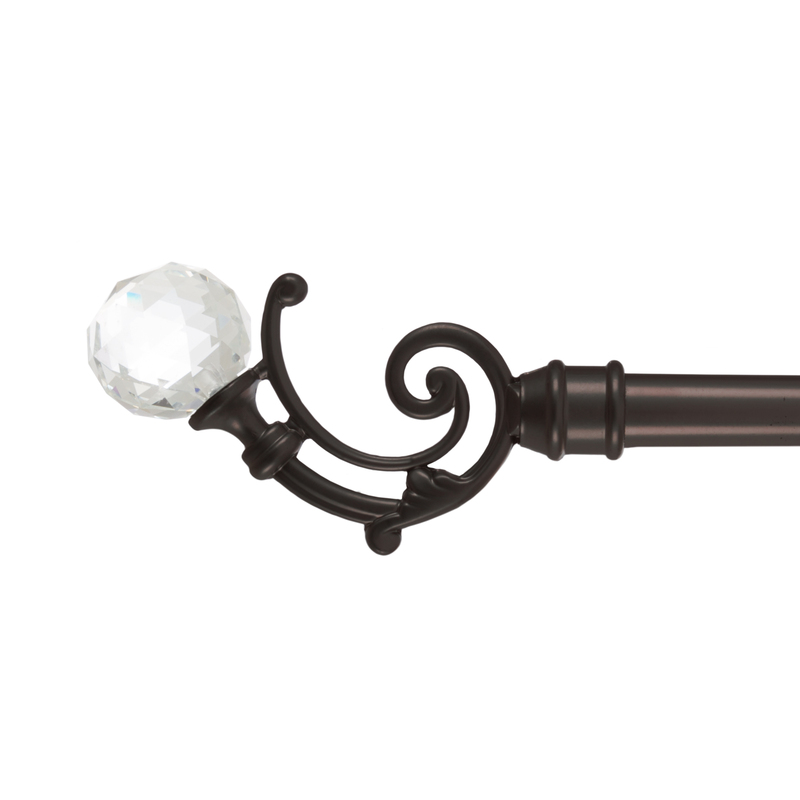 ATTRACTIVE HOME ACCESSORY- This curtain rod with crystal ball finials is designed to complement any home décor and helps create an elegant atmosphere in any room. It can even be used to hang photo frames or artwork to create a unique gallery. HIGH QUALITY- The lightweight and stylish rod is made with high-quality steel and features a textured bronze finish to suit a variety of color palettes within the home. It is also sturdy and strong enough to support any curtain for long-term use. PRODUCT DETAILS- Dimensions: Rod measurement: 48-86 inch EXTENDABLE; 3/4 inch Diameter.� Rod Finial Measurement: 5 1/4L x 1 1/2W x 3H. Material: Steel with Bronze Finish. Wall mounting brackets and hardware included. Home territory searches the web to find the best prices and availability on Window Hardware and related products foir your home like Curtain Rod with Mounting Hardware and Decorative Crystal Ball Finials 66-144Â� by.... For this page, related items include products we find that match the following keywords: "Window Hardware" at our vendor partner Walmart - Click More Info / Buy Now to check for price rollbacks!. Curtain Rod with Mounting Hardware and Decorative Crystal Ball Finials 66-144Â� by... is one of 144 Window Hardware and related products available for sale through HomeTerritory.com, If you have any questions on this product, please give us a call at 734-971-1210 during the hours of 9am - 5pm EST for assistance. Thank you for shopping at Home Territory, the home furnishings superstore!